How many WWII and post-war stories haven’t been told yet? How many atrocities have we not heard of? There must be a huge number. It’s important that we hear about them. Many stories help us see what happened in a new light, add something to the discussion about war and post-war. And some of them are even important for the understanding of contemporary issues. 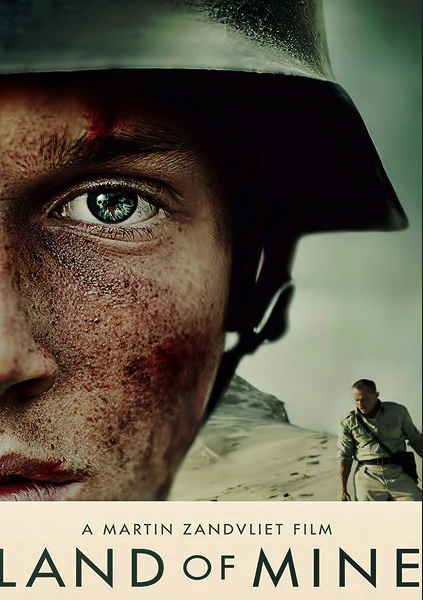 The fantastic Danish-German co-production Land of Mine – Under Sandet is one of those. While it doesn’t tell a true story, it’s inspired by facts. As Martin Zandvliet, film director and writer of this movie, said in an interview, these facts show us how quickly people can become a monster when they fight monsters. Some of what he said and some of what we see in the movie, sounded and looked all too familiar. At the opening of the movie we see Sgt Carl Rasmussen freak out. He sees a German POW carrying a Danish flag. This infuriates him so much, he beats the guy up. The war is over and there are hundreds of German POWs returning home. The Danish hate them. Rasmussen hates them so much, he almost kills the German soldier. Maybe this hatred of the enemy makes his superior decide he’s qualified for the job he is going to give him. There are 2,200,000 million land mines buried on the Danish beaches. No other country has this many and it’s obviously vital that they should be dug up and defused. It also seems natural to use German soldiers to do that. For Rasmussen this is only logical—Germans planted the mines, Germans will have to defuse them. If the one or the other dies – all the better. What he doesn’t expect however is that the POW’s he is sent are very young soldiers. Almost kids. The oldest is nineteen. But Rasmussen soon overcomes his initial hesitation and the dangerous work begins. Over the course of the movie, we watch the young people dig up thousands of mines and defuse them. It’s horrible work and watching them had me on the edge of my seat the whole time. I don’t think there’s anything that gets to me as much as watching movies about bomb disposal teams. Be that The English Patient, The Hurt Locker, the UK TV series Danger UXB or this movie, Land of Mines. Every time someone starts to dig up, we know there’s a huge risk. Those scenes are always agonizingly slow. I had to brace myself for whatever would happen. Many lose limbs, many lose their lives. The movie’s not an action movie. It’s a psychological exploration and a character study. Rasmussen may hate Germans but he doesn’t want to mistreat kids. Nor does he want to see them maimed or dead. The movie shows subtly, how they begin to understand each other. How there’s some sort of camaraderie between them and how fragile that is. This is such and excellent, harrowing movie. Such an emotional rollercoaster ride. The actors, many of which had never acted before, are outstanding. There are many small stories, relationships, friendships, that make the losses, the danger all the more poignant. I can’t say too much or it would spoil the film. I hadn’t heard of these historical facts before, wasn’t aware of the number of land mines or that they used German children to defuse them. Not many survived. It’s a shocking story. It’s shocking to realize how easily people start to hate people and wouldn’t hesitate to take revenge. Even in a case like this, in which so many of the enemy soldiers hadn’t even seen battle and mostly hadn’t volunteered to go to war. The movie is as much about a forgotten dark side of Denmark’s history as it is about keeping our humanity. No matter what. I hope that I managed to capture how amazing this movies is. It’s hard to watch, at times almost unbearable, but so rewarding.